I've pretty much settled on my next tattoo. Now Im just having difficulty picking where itll go on my body. I like to avoid back tattoos, at least right now, just because I want to be able to see it without a mirror. I really like this for the base. The feathers are going to be a different color and I want to incorporate color in another place but I cant figure out where. Im so dead set on a horse tattoo that Im trying to make this work but I might need to find a different base, especially for the location I am thinking about. Im thinking my forearm. But that will be a huge step for me because my family doesnt know about my tattoos and probably would not be very happy with me if I show up with one next time they see me. Im having trouble though thinking about how it will sit on my arm. Suggestions for placement, color, or for a different base image for me to tweak are all awesome. This is my tattoo ideas board on Pinterest. In case anyone wants to flip through it. What about the thigh for placement? Btw I'm loving your pinterest board! I love that!!! AHH that is perfect! 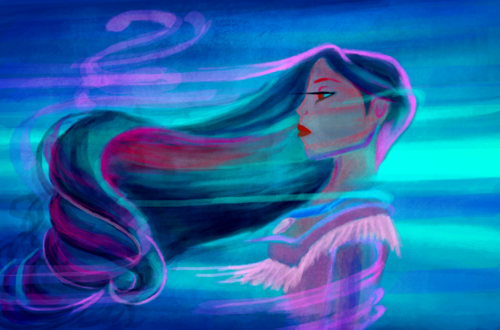 Can you imagine me walking in to talk to the artist and saying "For the background, think in terms of colors of the wind... you know... from pocahontas"
if you take visuals you won't sound too crazy.